This traditional method of collecting waste is still mostly used today. Plastic wheeled bins are, however, vulnerable and fire-sensitive with the risk of toxic fumes and propagation. 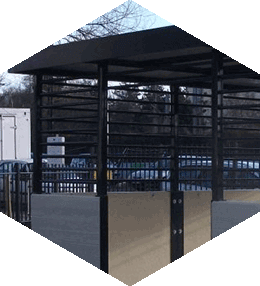 Bihr therefore proposes the Pavabac® range - plastic bin storage solutions used to organise outside collection points and encourage sorting of waste through appropriate signs. Armed with over 25 years’ experience in waste pre-collection solutions, Bihr Environnement has designed the Pavabac® range in line with current and future traditional collection needs. 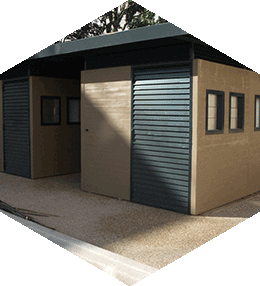 Three modular models can meet all requirements: the Lucia Shelter (UGAP-referenced), the Centurion Kiosk and the Modul’Parc Park. All products in the Pavabac® range are made of fire-resistant concrete components (rating M0) and offer excellent protection against vandalism and shocks. The openings are in steel to reduce the force required to move them and make them easier to inspect. All models in the Pavabac® range are designed to accommodate 350 to 1100 L bins. 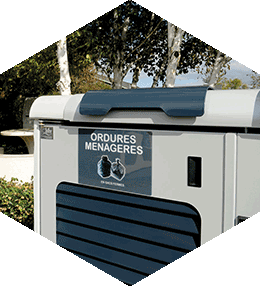 Their storage capacity can be adjusted to the desired number of bins thanks to their modular design.